Germline mutations in SPRED1, a negative regulator of Ras, have been described in a neurofibromatosis type 1 (NF1)-like syndrome (NFLS) that included learning difficulties in some affected individuals. NFLS belongs to the group of phenotypically overlapping neuro-cardio-facial-cutaneous syndromes that are all caused by germ line mutations in genes of the Ras/mitogen-activated protein kinase extracellular signal-regulated kinase (ERK) pathway and that present with some degree of learning difficulties or mental retardation. We investigated hippocampus-dependent learning and memory as well as synaptic plasticity in Spred1−/− mice, an animal model of this newly discovered human syndrome. Spred1−/− mice show decreased learning and memory performance in the Morris water maze and visual-discrimination T-maze, but normal basic neuromotor and sensory abilities. Electrophysiological recordings on brain slices from these animals identified defects in short- and long-term synaptic hippocampal plasticity, including a disequilibrium between long-term potentiation (LTP) and long-term depression in CA1 region. Biochemical analysis, 4 h after LTP induction, demonstrated increased ERK-phosphorylation in Spred1−/− slices compared with those of wild-type littermates. This indicates that deficits in hippocampus-dependent learning and synaptic plasticity induced by SPRED1 deficiency are related to hyperactivation of the Ras/ERK pathway. Sprouty-related proteins with an EVH-1 domain (Spred proteins) belong to a novel family of evolutionary conserved, negative regulators of the Ras/extracellular signal-regulated kinase (ERK) pathway (Casci et al., 1999; Wakioka et al., 2001). The Ras/ERK pathway is a signal transduction cascade that is crucially involved in various physiological and pathological processes, including the cellular mechanisms underlying synaptic plasticity and memory formation (English and Sweatt, 1996, 1997; Atkins et al., 1998; Selcher et al., 1999; Krab et al., 2008). Spred1 is a member of this protein family that is predominantly expressed in adult mouse brain (Kato et al., 2003). Notably, heterozygous loss-of-function SPRED1 mutations were recently shown to cause neurofibromatosis type 1 (NF1)-like syndrome (NFLS) in children that included learning difficulties (Brems et al., 2007), which suggests that this regulatory protein is involved in neural and behavioral plasticity as well. To test this hypothesis, we have studied hippocampus-dependent learning and memory with two different procedures in Spred1−/− mice and their heterozygous and wild-type littermates. In addition, we analyzed long-term potentiation (LTP) and depression (LTD) of synaptic responses in the hippocampal CA1 region of these mice, and examined Ras/ERK activation in relation to hippocampal synaptic plasticity. Spred1−/− mice were generated by homologous recombination techniques. Exons containing the kit-binding domain and Sprouty-related cysteine rich domains were deleted (Inoue et al., 2005). Heterozygous mice were backcrossed 11 times onto a C57BL/6J background, and F11 heterozygous mice were then crossed to obtain three different genotypes (Spred1+/+, +/−, −/−) that were used in all experiments, except in the T-maze where different genotypes were obtained by crossing F13 heterozygous mice. All mice were genotyped by means of PCR on DNA extracted from mice tails. Mice of mixed genotype were housed in groups of 3–5 at standard laboratory conditions (12 h dark/light cycle, constant room temperature and humidity, standard laboratory chow, and water ad libitum). Only female mice of similar age (maximum 4 weeks difference) were used for the experiments. Basic neuromotor tests and Morris water maze were performed at the age of 3–5 months, T-maze at the age of 6–7 months, and LTP and LTD recordings at the age of 6–8 months. Spred1−/− mice are viable and show no changes in gross anatomy, except a shorter face and smaller size than their wild-type (WT) littermates (Inoue et al., 2005). Grip strength was measured using a device consisting of a T-shaped bar connected to a digital dynamometer (Ugo Basile). Mice were placed before the bar and when they grabbed it, they were gently pulled backwards until they released the bar. For each animal, 10 measurements were obtained. Motor coordination and equilibrium were tested on an accelerating rotarod (Med Associates). Mice were first trained to balance on a rotating rod for 2 min at constant speed (4 rpm). Four test trials with an intertrial interval of 10 min followed, in which the rotarod accelerated from 4 to 40 rpm in 5 min. Time until they dropped from the rotarod was recorded (up to 5 min cutoff). Pain sensitivity was tested in the tail-flick procedure. The end of the tail of the mouse (∼2 cm) was held in 50°C water, and time until the mouse withdrew its tail was measured. This experiment was performed with 12 WT, 12 Spred1+/−, and 13 Spred1−/− female mice of the same genetic background as the ones used for the other experiments. Evoked potentials were recorded to test the integrity of the visual and auditory afferent pathways. Visual evoked potentials (VEP) were registered on a Myos 4 plus digital EMG/EP recorder (Schwarzer). Mice were anesthetized with an intraperitoneal injection of pentobarbital (60 mg/kg). An active needle electrode was placed between the eyes, a reference electrode at an occipital position (perpendicular to the active electrode), and a third electrode near the base of the tail (ground). Mice were adapted to the dark at least 30 min before starting the recordings. They were placed in front of a flash light and tracings were obtained by averaging 200 responses. Brainstem auditory-evoked potentials (BAEPs) were recorded immediately after the VEP recording using the same equipment. A needle electrode was placed above each ear and referenced to a common electrode near the base of the tail. A fourth electrode, also placed near the base of the tail, was used as ground. Five-peak tracings were obtained by averaging 2000 responses evoked by 85–86 dB clicks emitted by a speaker placed 1 cm in front of the animal's head. Latencies of the first five peaks were measured. Three animals died during this study period (one WT, one Spred1+/−, and one Spred1−/−) and were excluded from further analysis. Hippocampus-dependent spatial learning was tested in WT (n = 21), Spred1+/− (n = 21), and Spred1−/− mice (n = 16) using the hidden-platform version of the Morris water maze. Two Spred1−/− animals died from unknown cause in the weeks after completion of the water maze; the data from these animals were excluded from further analyses. A 15 cm round platform was placed at a fixed position in a 150 cm circular pool, 1 cm beneath the surface of the water (26°C and opacified with nontoxic white paint). Each daily trial block consisted of four swimming trials (15 min intertrial interval), starting randomly from each of four starting positions. Mice that failed to find the platform within 2 min were guided to the platform. All mice had to remain on the platform for 15 s before they were returned to their cages. There were two sessions of five trial blocks followed by 2 d of rest and a probe trial. During these probe trials, the platform was removed from the pool, the mice were released in the opposite quadrant, and their search patterns were recorded for 100 s. Swimming paths of the mice during trial blocks and probe trials were recorded using EthoVision video tracking equipment and software (Noldus). Hippocampus-dependent visual discrimination learning was tested in WT (n = 20), Spred1+/− (n = 21), and Spred1−/− (n = 18) animals using a T-shaped dry-land maze (arms: 50 cm long, 5 cm wide) as described previously (Van der Jeugd et al., 2008). One Spred1−/− mouse died during the training phase of the experiment and was excluded from further analyses. Each arm of the maze was closed by a sliding door located 10 cm from the junction. The mice were food deprived until 80–90% of their original body weight. During initial discrimination training, the mice were rewarded with a chocolate cereal to choose the arm with the white door and avoid the arm with the black door. A correct choice required the mouse to touch the chosen door with its nose, after which the door was lifted to provide access to the reward placed behind it. The maze was wiped thoroughly between each trial to eliminate odor cues. The position of the rewarded (white) door was randomized between trials. Each mouse performed eight trials per day with a 5–10 min intertrial interval, and the first phase ended when the group average reached the criterion of ≥75% correct responses during three consecutive days of testing. During the second phase, mice were trained to distinguish between two graphical images (5 × 5 cm2, 50% white and 50% black surface) on the doors of the lateral arms. The different images (see also inserts in Fig. 2b) consisted of a black circle on a white background, a vertical black area on a white background, and a checkerboard pattern (they were designated stimulus A, B, and C in a randomized manner across subjects). During the first acquisition training, stimulus pair AB was presented, and A was rewarded. The sessions were repeated until the mice reached a score of 75% correct responses, or the performance was stable during three consecutive days. Next, mice were trained on stimulus pair BC, and B was rewarded. During the final mixed-trial training, two consecutive presentations of each pair (AB and BC) were given four times a day. The concluding test phase comprised four trial blocks that consisted of three presentations of the trained pairs (AB and BC) and two presentations of an untrained transitive pair (AC). Correct responding to this transitive pair (i.e., choosing stimulus A) required transfer of the reward history of stimuli A and C obtained during the preceding learning on pairs AB and BC. Spred1−/− or WT female littermate mice were killed by cervical dislocation, and the hippocampus was rapidly removed and placed in carbogen-saturated (95% O2/5% CO2) ice-cold artificial CSF (ACSF). From the dorsal area of the right hippocampus, transverse 400-μm-thick slices were prepared with a tissue chopper and placed and maintained at 32°C in a submerged-type chamber, continuously perfused with ACSF (2 ml/min) saturated with carbogen. After ∼90 min incubation, one slice was arbitrarily selected and a lacquer-coated monopolar stainless steel or tungsten stimulation electrode was placed in the stratum radiatum. For recording, a glass electrode (filled with ACSF, 1–4 MΩ) was placed in the stratum pyramidale of area CA1 to record field EPSPs (fEPSPs). The time course of the fEPSP was inferred from its initial slope function. To assess basic properties of synaptic responses, input/output curves were recorded. The stimulation strength was adjusted to elicit a fEPSP slope of 35% of the maximum and kept constant throughout the experiment. Paired-pulse facilitation (PPF) was investigated by applying two pulses in rapid succession (interpulse intervals of 10, 20, 50, 100, 200, and 500 ms, respectively) at 120 s intervals. During baseline recording, three single stimuli (0.1 ms pulse width, 10 s interval) were measured every 5 min. Conditioning stimuli for LTP and LTD were as follows. For LTP, a single theta-burst stimulation (TBS) was used: 10 pulses of four stimuli at 100 Hz, separated by 200 ms, 0.2 ms pulse width (Larson et al., 1986). For LTD, low-frequency stimulation (LFS) consisted of 1800 pulses at 2 Hz, with 0.2 ms pulse width delivered for 15 min. Immediately after TBS or LFS, evoked responses were monitored at 1, 4, 7, and 10 min and then subsequently recorded every 5 min up to 4 h. The recording of slices from mutant mice was interleaved by experiments with wild-type controls. After completion of an LTP experiment, stimulated and unstimulated (time-matched control) slices were frozen in liquid nitrogen and stored at −70°C. The tissue from these slices and from contralateral hippocampi not used for electrophysiology was homogenized in ice-cold buffer containing 10 mm Tris HCl, pH 7.4, one Complete Mini Protease Inhibitor Cocktail tablet (Roche Diagnostics), and Protein Phosphatase Inhibitor Cocktails 1 and 2 (Sigma). Sample protein concentrations were established using the BCA protein assay kit (Pierce). Proteins were separated by NuPAGE NOVEX Bis-Tris gel 4–12% (Invitrogen) electrophoresis and transferred to a HyBond-P polyvinylidene difluoride (PVDF) membrane (GE Healthcare Bio-Sciences). After blocking with 5% nonfat milk, membranes were incubated overnight at 4°C with polyclonal rabbit phospho-Erk1/2 (pErk1/2) antibody (Cell Signaling Technology), then incubated with horseradish peroxidase-conjugated anti-rabbit antibody (GE Healthcare Bio-Sciences) for 1 h at room temperature, and visualized with enhanced chemiluminescence (Perkin-Elmer). After stripping, membranes were reprobed with polyclonal rabbit Erk1/2 antibody (Cell Signaling Technology) and afterward with β-actin (Sigma). Golgi-Cox staining of hippocampal sections obtained from Spred1−/− and wild-type littermates was performed according to the manufacturers' instructions using the FD Rapid GolgiStain Kit (FD NeuroTechnologies). Sagittal sections, 100 μm thick, were cut on a microtome with cryostat adaptations. Granule cell selection for further analysis was performed by a single observer, who was blind for genotype. Branching was manually counted using a 40× objective, and a calibration grid was used to count the number of spines per 10 μm. For transmission electron microscopy, mice were fixed by transcardiac perfusion with 6% glutardialdehyde in 0.1 m Sörensen phosphate buffer, postfixed in 1% OsO4, dehydrated and embedded in Epon/glycid ether (Serva), using propylene oxide as an intermediate. Semithin and ultrathin sections were cut on a Reichert OmU 4 ultramicrotome at 1 μm and 70 nm, respectively, and the latter contrasted with uranyl acetate and lead citrate before evaluation in a Zeiss EM 910 transmission electron microscope. All data are presented as mean and SEM. Differences between groups were examined using Mann–Whitney U test or ANOVA procedures with Fisher's least significant difference (LSD) test for post hoc comparison. For within-group comparisons, Wilcoxon matched-pairs signed rank test was applied. There were no differences in neuromotor and sensory perception abilities in Spred1−/− mice (supplemental Fig. 1, available at www.jneurosci.org as supplemental material). Both grip strength and accelerating rotarod performance were indistinguishable from WT. Visual as well as auditory evoked potentials were normal in appearance and peak latencies. Acute pain responses of Spred1−/− mice in the tail flick test were as vigorous as those of WT mice. Hippocampus-dependent spatial learning was tested using the hidden-platform version of the Morris water maze. Two series of daily acquisition trial blocks were interspersed with two probe trials during which the escape platform was removed (Fig. 1). Mean path length decreased in all three genotypes during the acquisition trials, but by the end of training, Spred1−/− mice failed to reach the same level of performance as wild-type or heterozygous littermates (Fig. 1a). While there was no significant difference during the first week of acquisition (p = 0.380), there was a significant effect of genotype on path length during the second week (p < 0.001). Impaired Morris water maze performance in Spred1−/− (KO, n = 14) mice compared with wild-type (WT, n = 21) and Spred1+/− (HZ, n = 21) littermates. a, There is no significant effect of genotype on mean path length during the first week of acquisition training (p = 0.4), whereas Spred1−/− mice are unable to reach the same performance as the two other genotype groups during the second week (p < 0.001). b, c, More specific spatial performance measures indicate that (b) Spred1−/− mice display significantly longer distance to target from day 2 onwards (genotype × trial block interaction, p = 0.003), and (c) there is significantly more persistent thigmotaxic swimming in Spred1−/− mice compared with the other groups during the first (p = 0.016) and second acquisition week (p = 0.002). Also, spatial memory performance is impaired in Spred1−/− mice during the probe trials. d, The first probe trial already indicates that Spred1−/− animals spent less time searching the target quadrant than Spred1+/− or WT mice (p < 0.05). WT and Spred1+/− mice showed a significant preference for the target quadrant, whereas in Spred1−/− mice, there was no difference between time in the target quadrant and any of the other quadrants. This is also obvious from representative heat plots that are shown above the bar charts (dwell frequency is indicated by coloration from red through blue; circle indicates platform position). target, adj, opp indicate target, adjacent, and opposite quadrants, respectively. e, Results of the second probe trial demonstrate that WT and Spred1+/− further increased their preference for the target quadrant, whereas Spred1−/− mice failed to develop such a preference even after prolonged training (p < 0.001 for time spent in target quadrant). *p < 0.05 (pairwise comparison with WT values). Mean escape latency decreased in all three genotypes during the acquisition trials (supplemental Fig. 2a, available at www.jneurosci.org as supplemental material), but Spred1−/− mice were unable to reach the same level of performance as Spred1+/− or WT littermates (repeated measures-ANOVA, p < 0.001). The longer escape latency in the Spred1−/− group was attributed to longer path lengths during the final test days as mentioned above, as well as to their lower swimming velocity (supplemental Fig. 2b, available at www.jneurosci.org as supplemental material). The Spred1−/− group also showed a higher tendency of floating behavior than Spred1+/− and WT animals (supplemental Fig. 2c, available at www.jneurosci.org as supplemental material). However, differences in other spatial performance measures, like mean distance to target and thigmotaxis, further indicate that Spred1−/− mice have a defect in spatial learning that is not reducible to motivational or sensory-motor changes in these animals. All three genotypes showed a decrease in mean distance to target over the different acquisition trials (Fig. 1b), but Spred1−/− mice displayed longer distance to target from day 2 onwards (genotype × trial block interaction, p = 0.003). Spred1−/− mice also displayed increased thigmotaxis (i.e., percentage of time spent swimming along the walls of the pool) in comparison with Spred1+/− and WT littermates (Fig. 1c). To determine whether or not Spred1−/− mice had actually learned the spatial position of the platform, mice performed probe trials with the platform removed (Fig. 1d–e). Notably, Spred1−/− mice displayed a different search pattern from Spred1+/− and WT mice during both probe trials (genotype × quadrant interaction, p < 0.001). In the first probe trial at day 8 (Fig. 1d), Spred1−/− animals spent less of their time in the target quadrant (p = 0.05), and more time in the opposite quadrant (p < 0.005) compared with Spred1+/− and WT mice. They also crossed the target area less frequently than Spred1+/− and WT animals (data not shown). After prolonged training during the second week of acquisition, differences in performance between the different genotypes became even more explicit in the second probe trial (Fig. 1e). Importantly, differences between genotypes remained significant even when poor swimmers (swimming velocity <5 cm/s during >50% of total swim time) were excluded from analysis (supplemental Fig. 2d, available at www.jneurosci.org as supplemental material), and detailed analysis of search patterns failed to show any spatial preference in Spred1−/− animals during the last probe trial (supplemental Fig. 3, available at www.jneurosci.org as supplemental material). The three Spred1 genotype groups were tested in a hippocampus-dependent visual discrimination procedure and subsequent transfer task using a T-shaped maze (Fig. 2). The tasks required little motor proficiency, and performance measures related to accuracy rather than latency or rate of responding. During the first 14 trial blocks, all groups reached criterion and learned to discriminate between black and white stimuli, but performance was significantly influenced by genotype (repeated measures-ANOVA, p = 0.004) and genotype × trial block interaction (p = 0.005). Actually, Spred1−/− mice failed to reach the same accuracy in black-white discrimination as Spred1+/− or WT littermates, and fell behind their WT littermates from trial block 10 onwards (Fig. 2a). On the last day of training (trial block 14), an average of 80.9% correct responses was observed in Spred1−/− mice compared with 98.2% in Spred1+/− and 95.6% in WT animals. Differences between Spred1−/− (KO, n = 18), Spred1+/− (HZ, n = 21), and WT (n = 20) mice in visual discrimination learning and transitive task performance in the T maze. 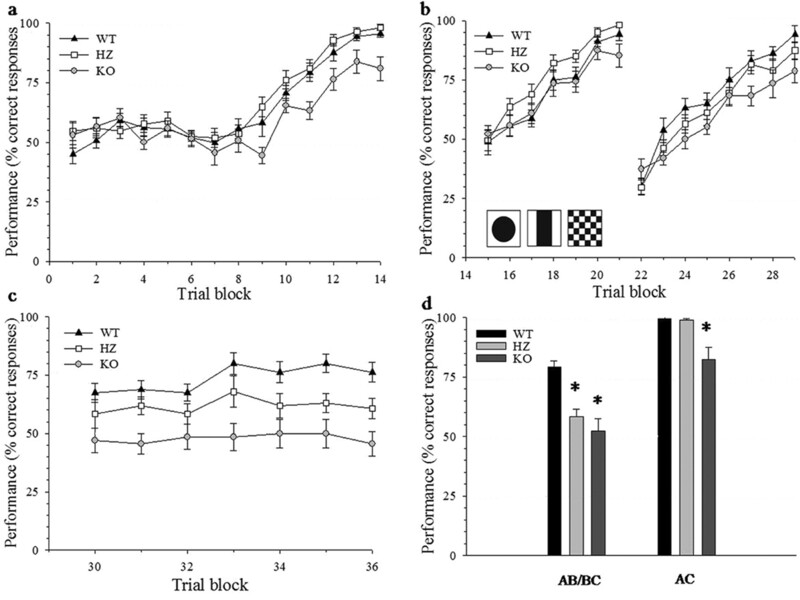 a, During initial black-white discrimination training, Spred1−/− mice showed less correct responses than their WT and Spred1+/− littermates, and fell behind their performance from trial block 10 onwards (p = 0.005). b, Acquisition training for AB and BC stimulus discrimination shows only borderline differences between the genotypes (stimuli A, B, and C are depicted at the bottom of the graph). c, Performance on mixed trials revealed highly significant differences between the genotypes (p < 0.001) with Spred1+/− animals displaying an intermediate level of performance. d, During the final test trials, Spred1−/− and Spred1+/− mice were significantly less accurate in AB and BC discrimination compared with their WT littermates (p < 0.001). Spred1−/− mice also performed significantly worse than the two other groups of mice on the untrained transitive pair AC (p < 0.001). *p < 0.001 (pairwise comparison with WT values). During the second training phase (Fig. 2b), Spred1−/− mice learned slower than their Spred1+/− and WT littermates, but the differences did not reach significance (borderline genotype effects: p = 0.054 for pair AB, and p = 0.079 for pair BC; interaction effects were not significant). Performance of Spred1−/− mice was consistently lower than that of Spred1+/− and WT littermates on the last trial blocks. There was a highly significant effect of genotype (p < 0.001) during the final mixed-trial presentations that appeared to be much more difficult for the Spred1−/− mice than for the other groups (Fig. 2c). Notably, performance of the heterozygous Spred1+/− mice was situated precisely between that of Spred1−/− and WT mice, and post hoc comparisons revealed differences between WT and Spred1−/− mice (p < 0.001), Spred1+/− and Spred1−/− mice (p = 0.001), and WT and Spred1+/− mice (p = 0.003). During this part of the procedure, percentage of correct responses averaged at 47.9% in Spred1−/− animals (i.e., chance level) compared with 61.7% in Spred1+/− and 73.8% in WT mice. During the concluding test phase (Fig. 2d), Spred1−/−, and to a somewhat lesser degree Spred1+/− mice, obtained a significantly lower level of accuracy than WT mice on the AB and BC pairs (p < 0.001). Also, Spred1−/− mice performed significantly worse than Spred1+/− and WT on the transitive AC pair (p < 0.001). Field EPSPs (fEPSPs) were recorded in the CA1 region of hippocampal slices. Similar to what has been observed in Nf1+/− mice (Costa et al., 2002), Spred1−/− slices showed reduced fEPSP slopes, which was specifically pronounced at high stimulation strength (p = 0.049, ANOVA) (Fig. 3a). This was not caused by decreased excitability of the Schaffer collateral pathway as there was no significant difference in presynaptic fiber volley (supplemental Fig. 4, available at www.jneurosci.org as supplemental material). 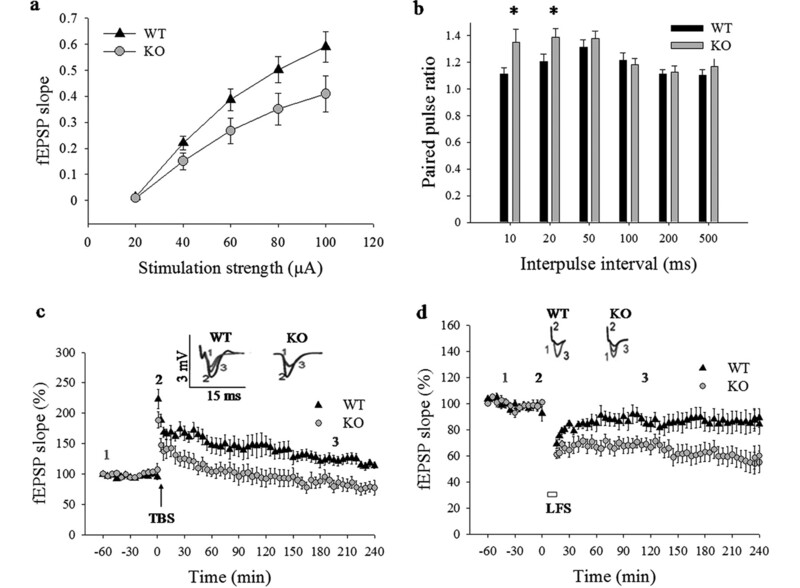 PPF, a presynaptic form of short-term plasticity, was actually increased at 10 and 20 ms interpulse intervals in Spred1−/− compared with WT slices (n = 12, p < 0.05) (Fig. 3b), which was again similar to what has been observed in Nf1+/− mice (Costa et al., 2002). To examine the involvement of Spred1 in long-term synaptic plasticity, we compared hippocampal LTP in slices from Spred1−/− and WT littermates. A single TBS resulted in robust late-phase LTP (>4 h) in WT slices, whereas potentiation in Spred1−/− slices was decremental and returned to baseline value after 55 min (both groups: n = 6; repeated-measures ANOVA, p < 0.05) (Fig. 3c). Finally, LFS induced LTD both in Spred1−/− and WT hippocampal slices (Fig. 3d), but the LFS train only produced transient response depression in WT slices, and returned to baseline after 90 min, while Spred1−/− slices showed robust LTD that lasted for >4 h (both groups: n = 6; p < 0.05). Differences in basic excitability and synaptic plasticity recorded on hippocampal slices from Spred1−/− (KO) mice and their WT littermates. a, Input–output curves indicate progressively lower fEPSP slope at stronger stimulation in Spred1−/− (n = 24) than WT (n = 31) slices (p = 0.049). b, PPF values (calculated as the ratio of the second on the first fEPSP slope) showed increased facilitation in Spred1−/− mice at 10 and 20 ms interpulse intervals (n = 12 for each genotype, p < 0.05, Mann–Whitney U test). c, Spred1−/− mice showed a consistent impairment of LTP in CA1 area after TBS, with responses returning to baseline values after 55 min (12 slices, 6 animals for each genotype, p < 0.05, Wilcoxon matched-pairs signed rank test). Insets, Representative analog traces, numbers indicate trace-time point. d, LTD is enhanced in Spred1−/− slices compared with those of WT mice (n = 12 slices, 6 animals for each genotype, p < 0.05, repeated-measures ANOVA). Open box under curves indicates duration of LFS. *p < 0.05 (pairwise comparison with WT values). We assayed Erk phosphorylation in hippocampi of Spred1−/− mice and their WT littermates. We could not detect a difference in hippocampal Erk phosphorylation pattern between Spred1−/− and WT mice in basal conditions (Fig. 4b). However, homogenates from hippocampal slices that had received the same TBS as were used for LTP induction did show small but significantly increased pErk2/Erk2 ratio in Spred1−/− compared with WT tissue (p = 0.030, ANOVA), which difference did not occur in time-matched control slices (Fig. 4a–d). 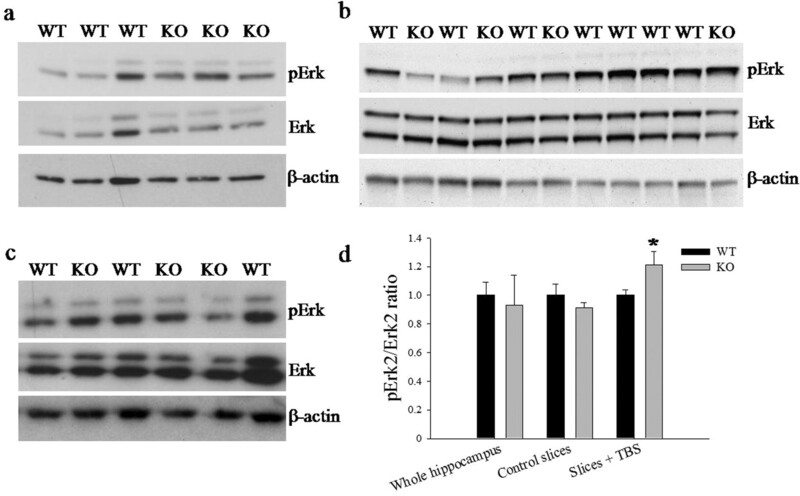 Differences in Erk activation between Spred1−/− (KO) and WT mice. a, Western blots display enhanced Erk2 phosphorylation in Spred1−/− (n = 5) versus WT (n = 8) in TBS-stimulated hippocampal slices (p = 0.030, ANOVA). Three representative samples of each genotype are shown. β-Actin is shown as a loading control. b, c, This enhanced pErk2/Erk2 ratio could not be found in whole hippocampi in basal conditions in two independent experiments (p = 0.741, n = 7 for WT, n = 4 for Spred1−/−; p = 0.888, n = 4 for WT, n = 5 for Spred1−/−) (c) nor in unstimulated control slices (p = 0.339, n = 6 for WT, n = 6 for Spred1−/−). Three representative samples of each genotype are shown. d, Bar-graphs indicate mean pErk2/Erk2 ratio which shows significantly higher ratios in the Spred1−/− slices (*p = 0.030, ANOVA) after TBS, but not in whole hippocampi or unstimulated slices. To test whether the absence of Spred1 affected neuronal morphology, we used Golgi-Cox staining to assess spine density, and the number of proximal and distal dendrites of hippocampal granule cells. However, none of these measures showed significant differences between WT and Spred1−/− mice (supplemental Table 1 and supplemental Fig. 5, available at www.jneurosci.org as supplemental material). Germline mutations in SPRED1, a negative regulator of the Ras/ERK pathway, have recently been reported to cause NFLS (Brems et al., 2007). NFLS belongs to a group of phenotypically overlapping neuro-cardio-facial-cutaneous (NCFC) syndromes, which all present with a variable degree of learning difficulties or mental retardation. In NF1, visuo-spatial problems rank among the most common cognitive deficits (Hyman et al., 2005), and Nf1 heterozygous mice consequently show impairments in visuo-spatial memory and hippocampal LTP (Costa et al., 2001, 2002). Genetic as well as pharmacological compensation for the loss of Ras regulation resulted in rescue of the learning defects in Nf1+/− mice (Costa et al., 2002). Moreover, the role of NF1 in learning and synaptic plasticity appears to be evolutionary conserved, because learning as well as cellular responses at the neuromuscular junction are impaired in Drosophila mutants of Nf1 (Guo et al., 1997, 2000). Also, in the newly described syndrome caused by SPRED1 mutation, some, but not all, affected individuals display learning difficulties. The objective of this study was therefore to investigate hippocampus-dependent learning and memory, and synaptic plasticity in Spred1-deficient mice. We have demonstrated that Spred1−/− mice show clear defects in the spatial component of water maze learning, and in several phases of visual discrimination learning in the T maze, both measures for hippocampus-dependent learning and neurocognitive functioning (Morris et al., 1982; O'Reilly and Rudy, 2001; Van der Jeugd et al., 2008). We also observed abnormalities in LTP and LTD of synaptic responses in hippocampal CA1 region (i.e., synaptic mechanisms essential for memory formation). Synaptic plasticity in this hippocampal region is of crucial importance to spatial reference memory (Tsien et al., 1996). In Morris water maze, Spred1−/− animals performed significantly worse during acquisition training, but performance of Spred1+/− mice was not impaired. Changes in several spatial measures during acquisition training and in probe trial memory performance indicate that Spred1−/− mice have spatial learning and memory defects that might be attributed to impaired hippocampal functions. These effects of Spred1 deficiency on hippocampus-dependent behaviors were further confirmed during visual discrimination training and transitive pair responding in the T maze. Notably, Spred1−/− mice showed marked impairments during nearly all stages of this elaborate procedure, but also heterozygous Spred1+/− animals performed at an intermediate level between that of their WT and Spred1−/− littermates, during the last and most difficult part of the T maze task. 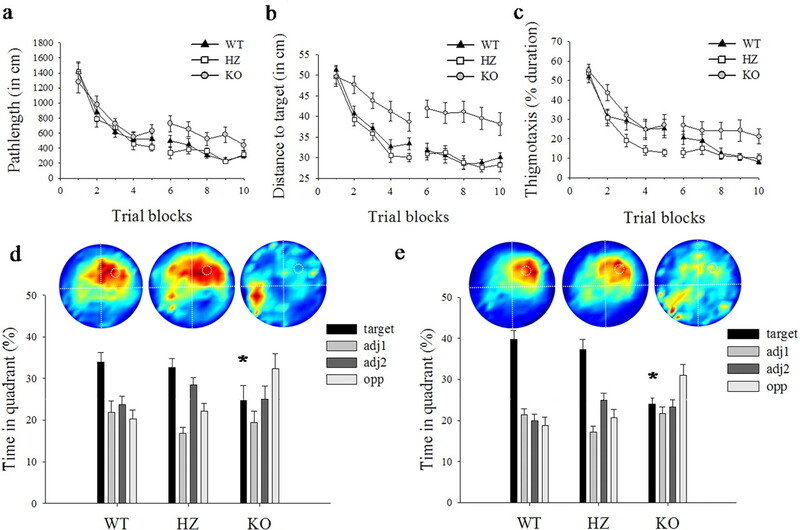 This latter finding suggests that heterozygous Spred1+/− mice may experience slight deficits in hippocampus-dependent cognitive functions as well. In addition, we found Erk hyperactivation in Spred1−/− hippocampal slices, but only after LTP-inducing TBS. This observation indicates that Spred1 is involved in hippocampal Erk pathways as well as in hippocampus-dependent neural and behavioral plasticity, which may be relevant for understanding human Ras/ERK disorders (Bentires-Alj et al., 2006; Krab et al., 2008). Increased Erk phosphorylation has also been shown in IL5-dependent cells transfected with a dominant negative Spred1 mutant (Inoue et al., 2005), and in SPRED1+/− and −/− melanocytes stimulated with stem-cell factor (Brems et al., 2007). In Nf1+/− mice, Erk hyperactivation was detected in both the hippocampus and the cortex. Notably, decreasing brain Ras/Erk activity in these latter mice rescued their LTP deficit, and reversed their spatial learning and attention impairments (Li et al., 2005). By and large, the behavioral deficits of Spred1−/− and Spred1+/− mice, as well as those of SPRED1 patients, mimic the neurocognitive impairments in mice and humans with germline loss-of-function mutations in NF1 (Costa et al., 2002; Hyman et al., 2005; Brems et al., 2007). Spred1−/− mice also show a remarkably similar synaptic phenotype to Nf1+/− mice that includes impaired LTP, reduced fEPSPs at higher stimulation strength (but normal fiber volleys), and increased PPF at short PP intervals (Costa et al., 2002). Such behavioral and synaptic changes in Nf1+/− mice were attributed to increased neural inhibition and facilitated GABA release (Costa et al., 2002; Cui et al., 2008). However, this clearly contrasts with the enhanced learning, LTP, and glutamate release observed in mice with Ras overexpression in excitatory neurons (Kushner et al., 2005). Thus, the phenotype of mice with elevated Ras/Erk signaling (including Spred1 and Nf1 mutants) could be related to increased neuronal inhibition, rather than to primary hyperexcitation. This work was supported by research grants from the Fonds voor Wetenschappelijk Onderzoek Vlaanderen (G.0578.06 and G.0551.08 to E.L.; G.0496.07 and G.0327.08 to D.B. and R.D. ); a Katholieke Universiteit (K.U.) Leuven Impulse Programme 2004 Grant (to R.D. ); a K.U. Leuven Research Grant (to D.B. ; OT/06/23); the Interuniversity Attraction Poles (IAP) granted by the Federal Office for Scientific, Technical, and Cultural Affairs, Belgium (2007–2011; P6/05; to E.L.); a K.U. Leuven Fellowship to T.A. ; and by a Concerted Action Grant from the K.U. Leuven (to E.L.). This work was partly supported by the Program for Promotion of Fundamental Studies in Health Sciences of the National Institute of Biomedical Innovation (07-4) to A.Y. E.D. is a predoctoral researcher of the Fonds voor Wetenschappelijk Onderzoek-Vlaanderen. H.B. is supported by the Institute for the Promotion of Innovation through Science and Technology in Flanders (IWT-Vlaanderen). We thank Leen Van Aerschot for technical assistance. ↵*E.D., T.A., and H.B. contributed equally to this work. AtkinsCM, Selcher JC, Petraitis JJ, Trzaskos JM, Sweatt JD (1998) The ERK cascade is required for mammalian associative learning. Nat Neurosci1:602–609. Bentires-AljM, Kontaridis MI, Neel BG (2006) Stops along the RAS pathway in human genetic disease. Nat Med12:283–285. BremsH, Chmara M, Sahbatou M, Denayer E, Taniguchi K, Kato R, Somers R, Messiaen L, De Schepper S, Fryns JP, Cools J, Marynen P, Thomas G, Yoshimura A, Legius E (2007) Germline loss-of-function mutations in SPRED1 cause a neurofibromatosis 1-like phenotype. Nat Genet39:1120–1126. CasciT, Vinós J, Freeman M (1999) Sprouty, an intracellular inhibitor of Ras signaling. Cell96:655–665. CostaRM, Yang T, Huynh DP, Pulst SM, Viskochil DH, Silva AJ, Brannan CI (2001) Learning deficits, but normal development and tumor predisposition, in mice lacking exon 23a of Nf1. Nat Genet27:399–405. CostaRM, Federov NB, Kogan JH, Murphy GG, Stern J, Ohno M, Kucherlapati R, Jacks T, Silva AJ (2002) Mechanism for the learning deficits in a mouse model of neurofibromatosis type 1. Nature415:526–530. CuiY, Costa RM, Murphy GG, Elgersma Y, Zhu Y, Gutmann DH, Parada LF, Mody I, Silva AJ (2008) Neurofibromin regulation of Ras/ERK signaling modulates GABA release and learning. Cell135:549–560. EnglishJD, Sweatt JD (1996) Activation of p42 mitogen-activated protein kinase in hippocampal long term potentiation. J Biol Chem271:24329–24332. EnglishJD, Sweatt JD (1997) A requirement for the mitogen-activated protein kinase cascade in hippocampal long term potentiation. J Biol Chem272:19103–19106. GuoHF, The I, Hannan F, Bernards A, Zhong Y (1997) Requirement of Drosophila NF1 for activation of adenylyl cyclase by PACAP38-like neuropeptides. Science276:795–798. GuoHF, Tong J, Hannan F, Luo L, Zhong Y (2000) A neurofibromatosis-1-regulated pathway is required for learning in Drosophila. Nature403:895–898. HymanSL, Shores A, North KN (2005) The nature and frequency of cognitive deficits in children with neurofibromatosis type 1. Neurology65:1037–1044. InoueH, Kato R, Fukuyama S, Nonami A, Taniguchi K, Matsumoto K, Nakano T, Tsuda M, Matsumura M, Kubo M, Ishikawa F, Moon BG, Takatsu K, Nakanishi Y, Yoshimura A (2005) Spred-1 negatively regulates allergen-induced airway eosinophilia and hyperresponsiveness. J Exp Med201:73–82. KatoR, Nonami A, Taketomi T, Wakioka T, Kuroiwa A, Matsuda Y, Yoshimura A (2003) Molecular cloning of mammalian Spred-3 which suppresses tyrosine kinase-mediated Erk activation. Biochem Biophys Res Commun302:767–772. KrabLC, Goorden SM, Elgersma Y (2008) Oncogenes on my mind: ERK and MTOR signaling in cognitive diseases. Trends Genet24:498–510. KushnerSA, Elgersma Y, Murphy GG, Jaarsma D, van Woerden GM, Hojjati MR, Cui Y, LeBoutillier JC, Marrone DF, Choi ES, De Zeeuw CI, Petit TL, Pozzo-Miller L, Silva AJ (2005) Modulation of presynaptic plasticity and learning by the H-ras/extracellular signal-regulated kinase/synapsin I signaling pathway. J Neurosci25:9721–9734. LarsonJ, Wong D, Lynch G (1986) Patterned stimulation at the theta frequency is optimal for the induction of hippocampal long-term potentiation. Brain Res368:347–350. LiW, Cui Y, Kushner SA, Brown RA, Jentsch JD, Frankland PW, Cannon TD, Silva AJ (2005) The HMG-CoA reductase inhibitor lovastatin reverses the learning and attention deficits in a mouse model of neurofibromatosis type 1. Curr Biol15:1961–1967. MorrisRG, Garrud P, Rawlins JN, O'Keefe J (1982) Place navigation impaired in rats with hippocampal lesions. Nature297:681–683. O'ReillyRC, Rudy JW (2001) Conjunctive representations in learning and memory: principles of cortical and hippocampal function. Psychol Rev108:311–345. SelcherJC, Atkins CM, Trzaskos JM, Paylor R, Sweatt JD (1999) A necessity for MAP kinase activation in mammalian spatial learning. Learn Mem6:478–490. TsienJZ, Huerta PT, Tonegawa S (1996) The essential role of hippocampal CA1 NMDA receptor-dependent synaptic plasticity in spatial memory. Cell87:1327–1338. Van der JeugdA, Goddyn H, Laeremans A, Arckens L, D'Hooge R, Verguts T (2008) Hippocampal involvement in the acquisition of relational associations, but not in the expression of a transitive inference task in mice. Behav Neurosci, Advance online publication. Retrieved December 15, 2008. doi: 10.1037/a0013990. WakiokaT, Sasaki A, Kato R, Shouda T, Matsumoto A, Miyoshi K, Tsuneoka M, Komiya S, Baron R, Yoshimura A (2001) Spred is a Sprouty-related suppressor of Ras signalling. Nature412:647–651.